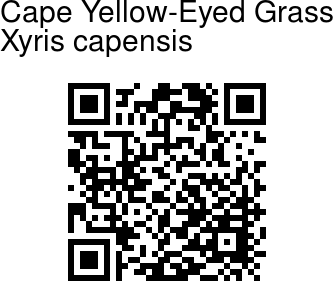 Cape Yellow-Eyed Grass is a rush-like perennial herb, occasionally annual, up to 6-30 cm tall, which occurs in clumps. It has a weak rhizome. The grass-like leaves are erect and about 5-15 cm long, 4 mm broad, tapering to hard points and have a fan-shaped arrangement that forms a sheath at the base around the stalk above the small, swollen rhizome. The flowering stems are usually twice as long as the leaves. 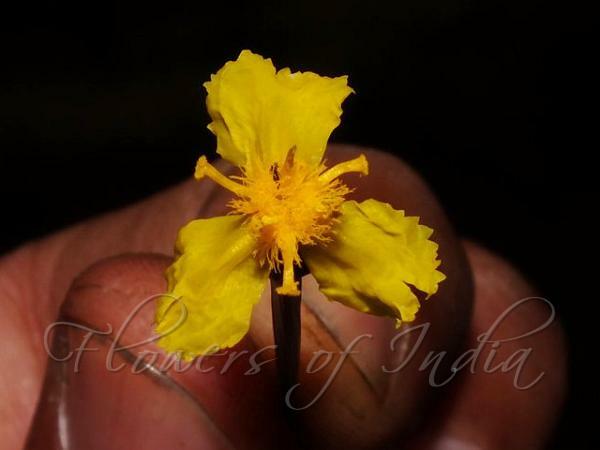 The flowers are yellow and clustered in a roundish inflorescence of 1 cm in diameter, among shiny golden-brown bracts, at the tip of the flowering stem. There are 3 sepals of which two are boat-shaped, whereas the third is membranous and envelops the flower in the bud. The flower has a slender tube with 3, spreading, very delicate petals, which whither quickly, so the flower lasts only a few hours, and 35 flowers open at the same time. Cape Yellow-Eyed Grass is found in the Himalaya from Nepal to Assam at altitudes of 1800-2800 m, and also in Ceylon, W. China, Malaysia, and Africa. Identification credit: Preeti Verma Photographed in Cherrapunji, Meghalaya.